Have you ever come home from a long day at work with the pleasant thought of kicking back in your favorite lawn chair with a cold beverage and enjoying the surrounding nature of your backyard? The flowers are blooming, the birds are chirping and you breathe in the sweet air of nature’s finest. You glance around at your Eden, your green kingdom and a smile of complete bliss tugs at the corners of your work-weary lips...only to crumple as your line of vision lands on the giant propane tank in the corner. And then, that buzzing noise leads you to the unsightly utilities box over by the butterfly garden. Garden eyesores. Everyone’s got them everyone’s trying to figure out how to deal with them. Here’s how you can soften that backyard view. There are plenty of creative DIY projects that are specifically geared towards hiding unsightly utility boxes and wires in your outdoor living area. You can take two or three tall shutters that are hinged to fold open into a standing screen. Paint them to match your patio design and if it’s wood, add some weather treatment. Then, pull that screen across to shield that robotic-looking box. If you have a utility box that is mounted on a wall, create a wooden box shield constructed from pallets. Hang them over the utility box. You can also turn the pallets into a plant hanger by adding some potted plants. A plain looking shed can throw off a backyard design when it can join the garden party by looking downright dapper instead. 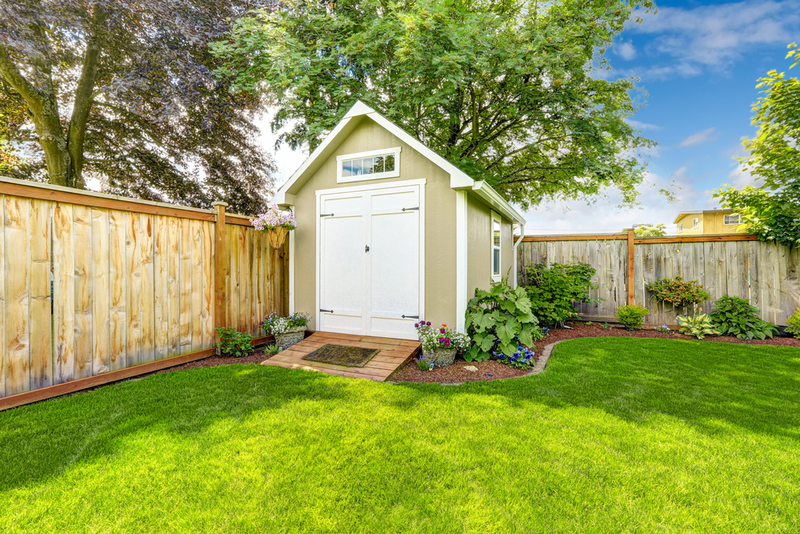 Just a few minor tweaks can turn your shed into a quaint little cottage. Paint your shed to match the color of your home. If there are windows, add flower boxes with beautiful cascading flowers. Adding some ivy on one wall doesn’t hurt, and boosts the whimsical feel. Throw in some extras, like a weather vane on the roof or a pebble path leading to the door. Tree stumps can be tricky, but it’s nothing some clever gardening can’t hide. If you don’t feel like dishing out the cash to have it professionally removed, make it a part of your landscape design. Hollow out the stump and use it as a planter. Fill it with herbs of flowers, then surround the stump with a few potted plants to create a small container garden.